Lantau will take the full brunt of typhoon Nida, according to Hong Kong and international weather services. The Hong Kong Observatory (HKO), US National Hurricane Centre and the Korea Meteorological Administration all predict Nida will strike Lantau Island, according to the Weather Underground (below). Taiwan, Japan and China forecasters are tipping it will make landfall on the western side of the Pearl River. The Observatory raised the No. 1 typhoon signal at 10pm Sunday, signifying that a tropical cyclone is within 800km of Hong Kong. It warned that weather conditions will “deteriorate rapidly” from Monday evening. 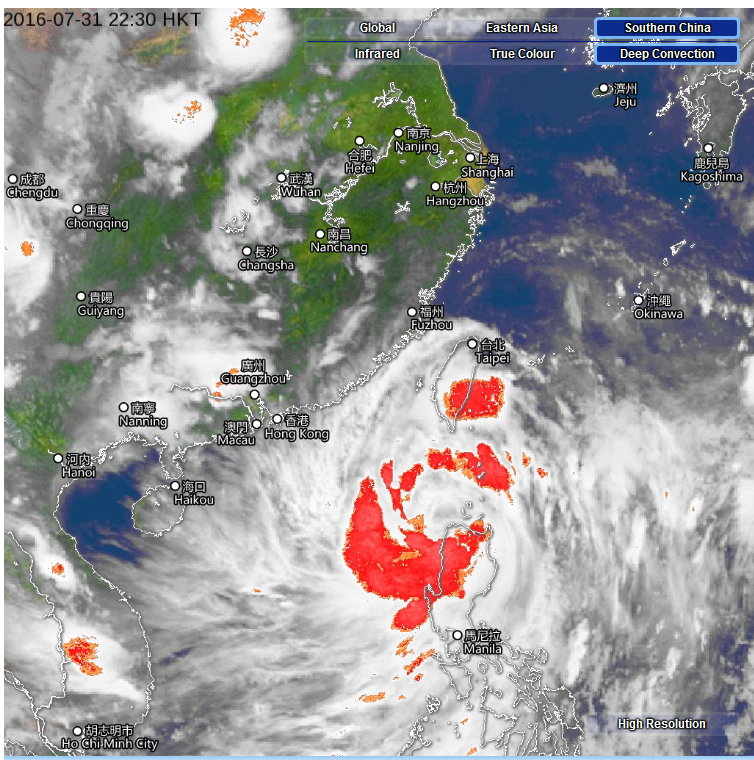 At 11pm Nida was about 770 kilometres east-southeast of Hong Kong (near 18.9 degrees north 120.6 degrees east) and is forecast to move northwest or west-northwest at about 25 kilometres per hour, HKO said. 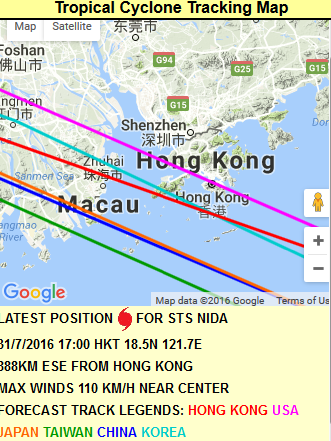 According to the present forecast track, Nida will be rather close to Hong Kong on Monday night to Tuesday morning. Weather over Hong Kong will deteriorate significantly with squalls, heavy rain and rough seas. There may be flooding in low-lying areas. Members of the public shall take all precautionary measures as soon as possible. The HKO advises householders to ensure gutters and drains are clear of obstructions and to check locks and shutters of windows and doors. Lantau police also issued a warning, urging residents to take precautions and pay attention to weather and news alerts. Probably not much. It has taken a path to the northeast of HK and has weakened so should be OK in Mui Wo.